I always meant to confess that I discovered evidence of the existence of a photograph of the Deschutes Chief of Scouts Stock Whitley last month through aimless late-night googling. Sometimes it pays off. I do less of it these days because of a shift change in a family member’s work schedule (the same excuse I give for doing less writing), but something similar happened after I received that portrait of Prof. Joseph Taplin Lovewell a few days ago. Examining the photo under a magnifying glass made me wonder if it might be a photograph of an oil painting, perhaps one that was commissioned in honor of the professor’s retirement from Washburn. There seems to be an underlying texture to the portrait, as if we’re seeing the faint bumps of a stretched canvas. However, the photographic paper itself was expensive stuff with a very elegant tooth, which was probably meant to mimic canvas. Besides that, the old professor’s face may have shown a few signs of textured weathering by the time he took a seat in a portrait studio around the turn of the century. The photographer, who seems to have been named “Rumrell” or “Rumrull,” proudly signed his name to the cardboard mount attached to the portrait, and the subject himself may have autographed it before sending it on to family members back in New Hampshire, who had it matted and perhaps framed. I did a search for “Lovewell” + “autograph” to see if I could find a sample of the professor’s handwriting for comparison. The autograph that turned up was about the last one I expected to see, a name signed to a document some two hundred years before the one I was looking for. The exhaustive and comprehensive eight-volume “Narrative and Critical History of America” was published in the mid-1880’s. 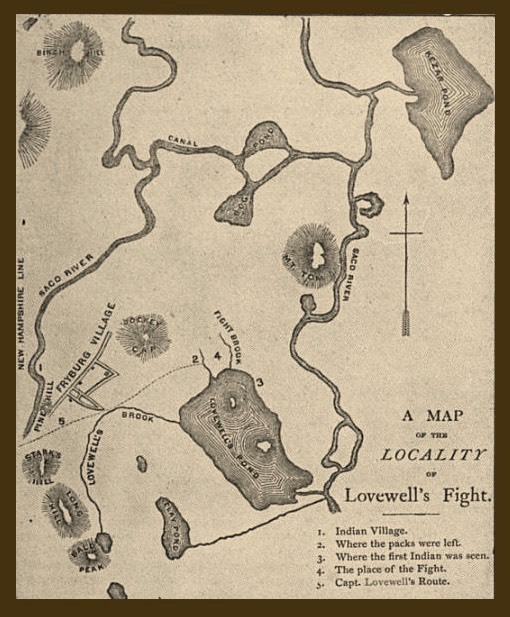 Covering an era before photography, the publisher stuffed each volume full of of maps and reproductions of the title pages of important early publications, such as Samuel Penhallow’s “History of the Wars of New-England With the Eastern Indians,” and “Entertaining Passages Relative to Philip’s War,” by Benjamin Church’s son Thomas. Lacking the likenesses of key players in these and similar historical events, the editor included numerous autographs of the famous men, including the surprisingly elegant script of that Indian-scalping great-great-grandfather of both Joseph Taplin Lovewell and Thomas Lovewell, Capt. John Lovewell. I’ve never subscribed to graphology, the idea that a person's handwriting unconsciously betrays the writer's personality traits. Do open loops really suggest an openness to new possibilities, or did some grammar school pedagogue brandishing a birch switch insist that his pupils form their letters that way? Whatever secrets handwriting might disclose, it’s still hard for me to reconcile the signature on the right with the sturdy frontiersman who made three treks into the wilderness to hunt hostile Abenakis. I just have to get used to the idea that valiant John Lovewell wrote sorta like a girl I knew in junior high who dotted her “i’s” with little hearts. Among the other bits of news that I've been forgetting to pass along is Dave Lovewell’s delight in counting five 100-car trains passing through the old village of Lovewell, Kansas, one morning late last month. The decrepit depot may continue to deteriorate, but those gleaming rails I noted last summer have given the site a new heartbeat. As Dave says of his great-grandfather Thomas, “the old gentleman would be amazed at what he has wrought.” In two years the railroad and what little remains of his village will turn 130 years old. A month back I heard from Scott, another descendant of Thomas Lovewell, who, judging from the clarity of his writing, must have been an English major. Thomas is my great-great grandfather, via William Frank, his son Wayne, and my mother Judith. Wayne, who was born 100 years ago, had clear memories of his long-haired and bearded grandfather, and he maintained quite close contact with brother Jim and sister-in-law Gloria. One of my prized possessions is my mother's copy of "The Lovewell Family." Grandfather Wayne accompanied her and Great Uncle Jim on at least one fact-finding trip to points east--New England, and I think Ohio, too--for her research. He was non-plussed by social climbing, even if it consisted of nothing more than looking for a famous forebear. He made a point of telling me that he put no stock in worrying about ancestors beyond a generation or two, but I note that he also enjoyed telling family stories about the exploits of Thomas, and even Captain John whose well-laid plans to remove the valuable scalps from their original Abenaki owners went awry when actually attempted. Scott paid Lovewellhistory.com the nicest compliment I could hope for, calling it a “bonanza of a website,” one that he first stumbled upon a year ago. I look forward to hearing more from him, and meeting him at the next reunion in 2017.